For the first time in her long life, an elderly capuchin monkey named Daisy will finally be able to experience what it's like to live the way nature intended - with the company of her own kind. And her new keeper, Louisa Marchbanks, tells The Dodo that things are already looking up for her. Daisy's story begins nearly a half century ago in the U.K., where she was raised in captivity at a primate breeding laboratory. Little is known about her early years or what she was subjected to while imprisoned at the lab, but her body still bears the signs of unimaginable abuses. By the time the facility closed and she was sold to new owners at around age 10, she had several dislocated fingers, cigarette burns checkering her back and a scar from an unknown medical operation. Over the next 35 years, Daisy's health improved while she was living with a family in the U.K., but it was still far from an ideal setting. The unnatural conditions of her new existence as a pet were tempered by the fact that she was kept with another capuchin with whom she could socialize. Last autumn, however, Daisy's companion passed away, so her longtime owners thought it best to find her a place to live out her days among other monkeys like herself. They contacted the Wild Futures primate sanctuary in Looe, England, in hopes of finding her a place with dozens of other rescued capuchins. In early January, Daisy finally made it to her new home, her sad face hinting at the long road of life that preceded her arrival. Thankfully, things are already starting to look up for her. "Within the first couple of days, we've started to notice that she's communicating with the other capuchins that she can see, which is always a wonderful thing to see in a monkey with her background," says Marchbanks. "Soon, she'll start to explore the territory. The keepers will be keeping a close eye on her, and we'll establish which monkeys she's most interested in and which social group she's most likely to set into. Socialization is a very slow process, and, obviously because of her age, we have to be extra careful. But we have quite a lot of other elderly capuchins here, and we're pretty confident that Daisy's lust for life, spirit and energy will mean that she's very keen to make friends." Daisy's sad life story is hardly surprising for her keepers. 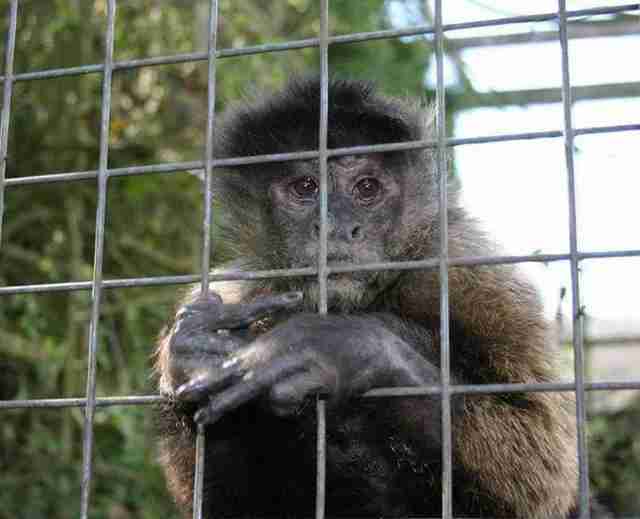 Each of the 30 capuchin monkeys at Wild Futures sanctuary was also rescued after being kept as a pet. "What tends to happen is that people keep these very cute babies in the house - then they start to grow up," says Marchbanks. "Although capuchins aren't large monkeys, they are extremely powerful, and the males in particular become extremely aggressive and powerful in their teenage years. That's when people no longer can really handle them or look after them." Monkeys kept as pets are prone to develop a number of physical and psychological ailments as a result of poor diets and the traumas of being raised apart from their families. 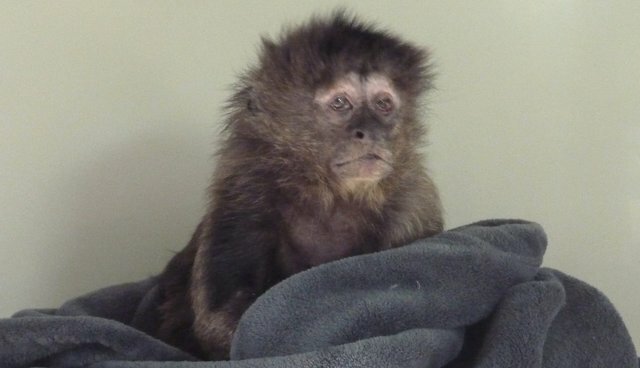 Sadly, though, the primate pet trade is still legal in the U.K., though the sanctuary hopes that stories like Daisy's will help change that for others like her. "Wild Futures sanctuary is campaigning to end the primate pet trade. We don't believe that anyone should be owning these wild animals as domestic pets; every owner that we've met will tell you the same story," says Marchbanks. "We're working hard to try to push that through as legislation to end the pet trade, and the first part is to raise awareness. Most people aren't even aware that it is legal to own monkeys as pets in the U.K."
In the United States, laws on keeping primates as pets vary from state to state, but animal welfare campaigners have launched a petition calling for the United States Department of Agriculture to enact a ban on the practice nationwide. To learn about how you can help Daisy and the other monkeys at Wild Futures, visit the sanctuary's website here.